The following are the latest results contributed by HM Courts Service, for cases sentenced by West Sussex Magistrates’ Court sitting at Worthing from November 30 to December 7, 2017. James Glanfield, 32, of Courtwick Road, Wick, was discharged conditionally for 12 months and must pay £20 victim surcharge, £85 costs, after admitting damaging an interior wall in Rustington on September 21, 2017. He was also given a restraining order. Peter Gillett, 58, of Arundel Road, Littlehampton, was jailed for 12 weeks after being found guilty of sending a video that was grossly offensive or of an indecent, obscene or menacing character in West Sussex on May 9, 2017. He was given a restraining order and must pay £115 victim surcharge. William Binder, 61, of Eastern Avenue, Shoreham, was fined £160 and must pay £30 victim surcharge, £85 costs, after admitting drink-driving (98mg of alcohol in 100ml of breath) in Upper Shoreham Road, Shoreham, on November 12, 2017. He was disqualified from driving for 23 months. Kirsten Hocking, 26, c/o Marine Place, Worthing, was given a community order with Rehabilitation Activity Requirement and must pay £85 victim surcharge after admitting stealing a parcel containing a £50 WiFi camera in Broadwater on November 13, 2017. She also admitted possessing 1.4g of cannabis in Cricketers’ Parade, Broadwater, on November 13, 2017, no separate penalty. Ryan Jackson, 22, of Truleigh Road, Upper Beeding, was fined £40 and must pay £30 victim surcharge, £85 costs, after admitting assaulting a police constable in the execution of his duty in Truleigh Road, Upper Beeding, on November 10, 2017. He also admitted breaching a conditional discharge order, no action taken. Kisoran Moodley, 40, of Falconers Court, Little High Street, Shoreham, was fined £307 and must pay £30 victim surcharge, £85 costs, after admitting driving without due care and attention in Brighton Road, Shoreham, on September 11, 2017. His driving record was endorsed with five points. Jack Staniland, 19, of King Street, Broadwater, was given a community order with Rehabilitation Activity Requirement after admitting sending electronic messages which were, in whole or part, of an indecent or grossly offensive nature, with the purpose of causing distress or anxiety in Worthing between February 28, 2017, and August 7, 2017. He was also given a restraining order and must pay £85 victim surcharge, £85 costs. 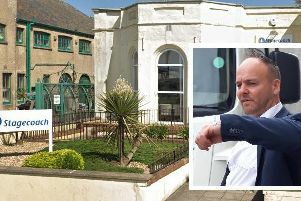 Andrew Vyoli, 41, of Warner Road, Broadwater, was given a community order with 12-week curfew, electronically monitored, from 8pm to 7am, and must pay £85 victim surcharge, £85 costs, after admitting drink-driving (104mg of alcohol in 100ml of breath) in Salisbury Road, Worthing, on November 11, 2017. He was disqualified from driving for 23 months. He also admitted driving without the correct licence and driving without insurance, no separate penalties. Michael McGean, 25, of Hurstfield, Lancing, was discharged conditionally for 18 months and must pay £20 victim surcharge, £85 costs, after admitting having a sword in Leconfield Road, Lancing, on October 18, 2017, without good reason. Sheik Oderuth, 31, of Teville Road, Worthing, was given a restraining order after admitting using threatening, abusive or insulting words or behaviour with intent to imply immediate violence would be used or to provoke immediate violence. He must pay £85 victim surcharge, £150 costs. Tommy Smith, 45, of St Brides, Brunswick Road, Worthing, was jailed for 16 weeks and given a restraining order after being found guilty of assault by beating, aggravated due to hostility based on sexual orientation, in Worthing on September 10, 2017. He was jailed for 16 weeks to run concurrently and must pay £115 victim surcharge after being found guilty of assault by beating, aggravated due to hostility based on sexual orientation, in Worthing on August 16, 2017. Rafal Bieniecki, 50, of Goodwood Close, Rustington, was given a community order with six-months curfew, electronically monitored, between 7pm and 7am daily, after admitting dishonestly failing to promptly notify Arun District Council of a change in circumstances, namely an increase in earnings, affecting Housing Benefit in Littlehampton between October 5, 2015, and November 20, 2016. He must pay £85 victim surcharge, £85 costs. Jane Child, 27, of River Drive, Cullompton, was given an eight-week prison sentence, suspended for 12 months, with Rehabilitation Activity Requirement, and must pay £50 compensation, £115 victim surcharge, £85 costs, after admitting assaulting a police constable in the execution of her duty at Worthing Custody Centre on November 18, 2017. She given an eight-week consecutive prison sentence, suspended for 12 months, and must pay £50 compensation after admitting assaulting a police constable in the execution of his duty at Worthing Hospital on November 18, 2017. She also admitted disorderly behaviour while drunk in Chatsworth Road, Worthing, on November 18, 2017, no separate penalty. James Dore, 30, of Lyndhurst Road, East Worthing, was fined £253 and must pay £30 victim surcharge, £85 costs, after admitting drink-driving (134mg of alcohol in 100ml of blood) in Brighton Road, Lancing, on July 23, 2017. He was disqualified from driving for 16 months. Daniel Willard, 29, of Overdown Rise, Portslade, was fined £200 and must pay £30 victim surcharge, £85 costs, after admitting using threatening words or behaviour or disorderly behaviour within the hearing or sight of a person likely to be caused harassment, alarm or distress between Shoreham and Worthing Railway Station on April 27, 2017.